No features will be tied to HW 3.0. They announce the HW3.0 switch over- probably starting in Q3. [Updated 4/7, H/T @ElmerFUDD] - it appears they may already be making some cars with HW3. Perhaps the 4/22 date gives them 3 weeks to clear out older cars before announcing the new HW? The game will be to announce L2 features and pretend like L4/L5 equivalents are coming soon. We will not see the legal disclosures. Elon will largely promise the world, but when things launch all liability will be on drivers. Tesla Network is back, but in the vaguest possible way. They will demo something every AV could do 4 years ago, except it's not reliable enough to actually do L4/L5. Before we dive into the predictions, we need an overview of what's happened so far. In October 2016, Elon announced that every new Tesla vehicle was equipped with "Full Self Driving" hardware. This was clearly described as L4/L5 autonomy. The only thing remaining was completion of the software and "regulatory approval". Every car being produced would be capable of being SW upgraded to L4/L5 autonomy. Not only did Elon announce this, he started selling FSD as a $3000 option. Here's the conference call transcript in which Elon talks about a Tesla dropping you off in Times Square- L5 autonomy. Soon after the announcement, Tesla released their famous "self driving video". It's now known that the video was shot over several days, required perfect traffic conditions, and may be spliced together from several takes. Elon also promised a coast-to-coast FSD drive by the end of 2017. The LA to NYC drive never happened. Tesla in fact got in some trouble for regressions in AutoPilot. The FSD announcement coincided with the release of "AutoPilot 2.0" featuring Tesla's own hardware instead of MobilEye. Unfortunately for buyers, AP2 was late, feature incomplete and generally inferior to AP1 for 12-18 months. In the years since AP launched, there have been 3 confirmed US deaths due to AutoPilot. The first involved AP1.0, a semi truck, and a driver watching a movie. It led to MobilEye pulling out of their deal with Tesla. MobilEye had long warned that Tesla was overpromising, and the death of a driver due to overconfidence in AP as well as lack of driver monitoring was too much for them. A second death occurred only a few miles from Tesla HQ as an AP2.0 drove an Apple engineer straight into a poorly protected barrier on US 101. The third death was more recent, also involving a semi, with AP driving straight under the semi, decapitating both the car & driver, and continuing on for another 3/10ths of a mile before stopping. While Tesla has faced criticism in the press from for the deaths, no government agency has found them responsible. In fact, the NHTSA cleared Tesla for the first death, and no findings have been released for any subsequent death. Further, Tesla fans seemed to take these deaths in stride- they don't seem to have impacted the brand or demand. These last points will I think weigh heavily on what we see in the future. This is how things stood for about 2 years. Occasional driver deaths, no visible progress on delivering FSD. Then in Oct 2018, Tesla suddenly stopped offering FSD. You could no longer prepay for the option (though apparently if you made a special request they'd take your money). No one knows exactly why they stopped offering it, though presumably there was regulatory pressure to stop selling vaporware. Four months later, as part of the Feb 2019 price cut panic, Elon announced that FSD was coming back as an option. Read the fine print however- it was no longer FSD. FSD was reborn as a mash of features already released in AutoPilot earlier in the year, lane change, auto park and "summon". In addition, the text for FSD no longer promises anything beyond standard L1/L2 features. Tesla is now clear that the driver remains responsible the whole time. Not even L3 is promised. 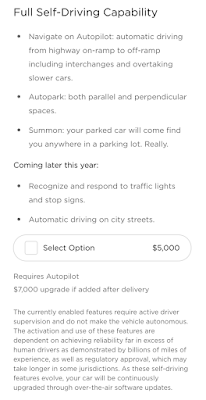 In addition to the existing, repackaged AutoPilot features, Tesla made promises about stop light detection and "automatic city driving"- whatever that means. Say what you will about the man, but Elon is fast learner. Con men have to be. The past 3 years have taught Elon some important lessons. I believe the death and resurrection of FSD is the first step in a series of moves designed to keep the FSD hype going, while legally protecting Elon and Tesla. Elon faces two problems with FSD. First, he promised FSD to hundreds of thousands of customers. In many cases taking money from those customers and delivering nothing. He's learned over the past 3 years what everyone knew in 2016- Tesla can't do FSD. The second problem Elon faces is brand image. In addition to the legal issues above, he cannot walk back the promises without damaging the brand. Tesla is about tech. An M3 is largely an expensive and somewhat impractical toy- an S/X definitely so. Elon needs to maintain a tech-forward image to maintain the brand. Otherwise driving a $120K S/X is just as gauche as driving a $120K Bentley. Like I said, Elon's a smart guy. The formula for a startup is often "find what works and stick with it". So what's worked for Elon in FSD? The answer is L2 autonomy. Other OEM and AV players have largely abandoned advanced L2. L2 is not that useful. You still need to pay attention- L2 doesn't deliver any time back to the owner. L2 is also dangerous without proper driver monitoring. The better L2 becomes, the more dangerous it is. If your L2 system only messes up once every 5000 miles, the average driver will see a system which works perfectly for months. They will learn to trust it. After 120 hours of mindless monitoring, the driver will not be prepared for the 2-3 seconds of crisis when the system gets confused. This is what happened in the Tesla AP deaths even though currently AutoPilot is FAR less capable than 5000 miles between failures. But solves both of Elon's problems. If you're not familiar with the motte-and-bailey metaphor, check out Slate Star Codex on the topic. Seriously- go and read it and don't come back. SSC is a much better author writing about much more important and interesting topics. Hopefully it's obvious where I'm going with this. L2 is the Motte- the thing Tesla can actually deliver. L4/L5 is the Bailey- the thing Tesla claims it can do. Nowhere in their description does it talk about self-driving. While a casual reader might see the name "Full Self Driving" and see "automatic driving" and think "this thing will drive itself", the fine print is very clear. In fact, if we read the fine print we can see BOTH the Motte and the Bailey: The currently enabled features require active driver supervision and do not make the vehicle autonomous. Do you see it? They've wordsmithed it to both be clear that nothing here is autonomous, but imply that future features might be autonomous. There's no actual contract promising autonomy, but the phrase "currently enabled features" implies future features will be autonomous. This is the dance Elon has been doing for the past year or so. All of Tesla's official documents say "driver in control" and "keep hands on wheel". But Elon goes on 60 Minutes and demonstrates not paying attention, no hands on wheel. Here he is retweeting someone violating Tesla's supposed policy. Elon has learned that he can do the same thing with FSD. Why promise actual autonomy when you can call it Full-Self Driving, but have the legal team write it up as L2? Then go on Twitter and demonstrate how you don't need to supervise at all! This is what they are going to do on April 22nd. Announce a bunch of mundane L2 features, while pretending like this is leading to L4/L5 features down the road. Elon's rash promise of FSD lead his own FSD lead to quit two months later. Since then Elon has been stuck. Every so often he makes new promises, then people forget and he makes another set of promises. FSD remains completely impossible. L2 has proven much easier. L2 features are way easier- you don't need 99.999% reliability- you only need 98%. It's about 2000x easier. We've also learned that NHTSA/NTSB/FTC won't stop Elon, as long as he's protected by legal verbiage. He can imply L4/L5 all he wants. He can call the feature "Full Self Driving" and "AutoPilot", but as long as somewhere it states that it's really L2, Elon seems to be legally safe. Even after 3 US driver deaths, Elon can talk for hours about how Tesla has full autonomy, as long as somewhere a driver has to check a "this is not autonomy" box. L2 features give Tesla fan boys tech baubles they can fawn over to justify their spending. Even when the tech is no better than a Nissan Altima, the fan boys are happy. Imagine how happy they will be as Tesla further pushes the boundaries of safety, all the while putting legal responsibility on the driver in case of failure. Buyers don't seem to care that Tesla's L2 is dangerous. It takes years for good statistics about safety to emerge, esp for large luxury cars made in relatively small quantities. Many Mercedes/BMW/Audi/Volvo models have no deaths at all over 2-3 years, so getting statistically meaningful data will take a long time. Add in the 1-2 year delay in statistical publishing and it'll be years before we truly understand the safety implications of AutoPilot. This is easy. They built their own chip. Elon will crow about it and compare it to 2-3 year old NVIDIA hardware, while ignoring comparisons to modern chips. This will be a pure pump using specs and touting the hardware development as progress. No features will be tied to HW3.0. It'll be mostly about future developments. Elon is in a tough spot. First, it's unclear that 10x flops really buys you anything. Most people in the field would say that anything you can do with the current HW, you can probably do with 10x HW, though perhaps at the margin accuracy is improved. Second, if they really limit features to HW3 then they will have to upgrade ~70-100K cars. That's expensive. They have neither the cash nor the service capacity to do this. It's important that they not create a need to upgrade, esp if it can be easily avoided. They will announce the HW3 switch over- perhaps in starting in Q3. As this will coincide with the next tax credit expiring, it works well to keep people from waiting to buy in order to get HW3. I don't know exactly how this will work overseas, but given the longer order timelines, it may be less relevant. [Updated 4/7, H/T @ElmerFUDD] - it appears they may already be making some cars with HW3. The plan might be to have already switched over by 4/22. The 3 week delay gives them time to move the old inventory before the announcement. Or they may be moving S/X first, and still tie HW3 in M3 to Q3? AutoPilot is dead. All future features will go into FSD to justify the price. Tesla near-term roadmap will be exclusively L2- no hard dates for L4/L5 features. The fine print on everything will be "active driver supervision". The game will be to announce L2 features and pretend like L4/L5 equivalents are coming soon. 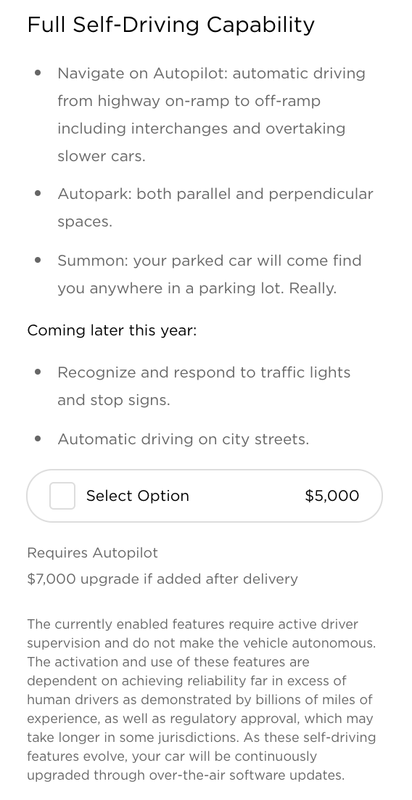 So "automatic city driving" will of course require active driver supervision, and Elon will give some hand wavy dates about when it will become truly L4/L5, perhaps talking about 'regulation', despite that fact that no such regulatory barriers exist. The fine print on all features will include specific warnings about pedestrians, bikes, construction etc... The driver will be made explicitly liable for any malfunctions. However, we will not see the legal disclosures at this event. Elon will push the bounds of the English language. Strongly implying fully autonomy at some points- and explicitly saying it at others, while the official PR releases create ambiguity. 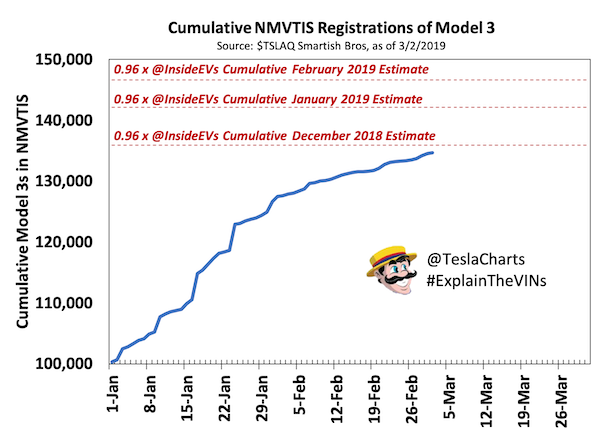 The Tesla Network has entirely disappeared from all Tesla PR, though not it should be noted from some analysts valuation metrics! This is the biggest wildcard. The impossibility of the network has made talking about it embarrassing three years later. Yet analysts still include it and Elon recently talked about the camera in the M3 as enabling ride sharing. Also the recent IPO of Lyft has no doubt made Elon aware of the enormous market caps given to ride share companies. My best guess here is they talk about this in terms of capabilities. They talk about HW3 and the cabin camera as enabling the "Tesla Network". Enough to keep the analysts happy. Enough to delude the fan boys into thinking they will earn money from their cars. But he'll stay away from hard dates or deadline, other than maybe "1-2 years". Yeah, this isn't a bold prediction for an Elon Musk event. But I confidently predict they will continue their charade of demonstrating a capability that mostly works, except 1% of the time it kills a driver or bystander. Basically they will demo something every AV company can do, except it's not reliable enough to actually do L4/L5. The specifics don't really matter. WayMo/Cruise can already perform every driving task- the challenge is getting to 99.999% reliability. Tesla will demonstrate something everyone could do 5 years ago, and it'll fool the fan boys and analysts who don't know any better. Wow! Interesting take. You seem fairly well-informed, so I feel that you must be aware that with the latest Autopilot updates, the car can navigate, on the highway only (for now), from point A to point B, passing slower cars and taking interchanges from one highway to the next, essentially hands-free (and feet too ;-) ). With a $10 2lb ankle weight (or any other sufficient hack) on the steering wheel, it can do so completely hands-free. I'm unaware of any other car that can do this at all. SuperCruise only does lane-keeping with adaptive cruise control. Waymo/Uber (and whoever else like them) only drive on very specifically-designated roads and areas, i.e., not virtually everywhere today. Also, you can't buy the systems Waymo/Uber/etc. use, so maybe they're not even up for consideration. Of the cars you can buy that compete (in theory) with Tesla, AFAIK, they're all just decent lane-keeping implementations. They don't actually navigate hands-free or even in the case of Teslas without hacks, hands-free(ish). As for safety compared to the other L2 or greater cars, you're right. Tesla's approach is less safe. There's no denying it. They're releasing features that the other companies possibly wouldn't release even if they could. In part, it's because they have a different philosophy of how to achieve L5 someday. They think the best way to get there fast is to train their software from thousands of real-world drivers and situations. They release this stuff to the public and collect data. Most of us who buy these cars know what we're getting ourselves into (for the most part). Could Tesla be more clear in their marketing? Yes, absolutely! But the vast majority know what they're getting. I do also agree that the infamous self-driving videos they released whenever ago were VERY misleading, even to me. I'm a software dev and I thought those videos were showing that they had that level of software developed to that degree at that time and they were just needing to refine it. I didn't know it was basically hard-coded(ish) and bore virtually no resemblance to the software they'd actually need to write to achieve true L3/4/5. However, even knowing that, I still bought a Tesla because again, I could see there really wasn't any other meaningful competition. I'd love to see them add driver monitoring to their cars and I have implored them several times to do so. I do think it could have prevented the Autopilot-related deaths that have occurred. But those deaths are really on the drivers in every single case at the end of the day. They should have remained vigilant just as one should when driving with old-fashioned cruise control. Yes, I understand the technology can lull one into a false sense of security and for that reason, Tesla and possibly even the NHTSA should bare some blame, but it doesn't sway me much because again, the same might be said for cruise control and poor implementations of AEB (which is most implementations). There are several other reasons to buy Teslas too. They have the best batteries, best motors, best charging network and the best software updatability too. Choosing to buy one is an easy choice to me. You stated the challenge is really in getting to 99.999% reliability. Tesla thinks you can't get there any time soon without releasing to massive numbers of real people and getting feedback/data. As a software dev, this idea resonates greatly because it's at the heart of the Agile software development movement and just makes sense. People just better stay fully alert and ready for anything, just like they should be doing already!